This Chocolate Cherry Galette combines a chocolate pie crust and an irresistible chocolate cherry filling. No canned filling! No store-bought pie crust! It is super easy to make, and you need just 20 minutes active preparation time. In the first semester of my study, I learned about classical conditioning. Classical conditioning is about a learning procedure in which an unconditioned stimulus is paired with a conditioned stimulus. An unconditioned stimulus can be thunder that makes you afraid or the smell of food that makes you hungry. The response to an unconditioned stimulus happens naturally, and you don’t think about it. A conditioned stimulus is a neutral stimulus what doesn’t cause any response like hungriness or afraidness (for example a whistle). When you pair an unconditioned stimulus with a conditioned one, you start reacting on the conditioned stimulus, in the same way, like on the unconditioned one. When you hear the sound of the escaping air out of an opening coke can just before you drink, you will start to react to this sound with thirstiness in the future because you learned that this sound appears just before you drink your ice cold coke. The same thing happened to me last year in San Francisco. Whenever the sun is shining, and the wind is lightly breezing, I immediately have butterflies in my stomach and miss San Francisco. I associate wind+sunshine with San Francisco since last year. My California trip was now almost a year ago, and my heart is still not back in Austria. I lost it in San Francisco, and I have such bad itchy feet, that it drives me crazy. Do you have a place where you lost your heart? Ok enough of psychology for today. Let’s talk about science. 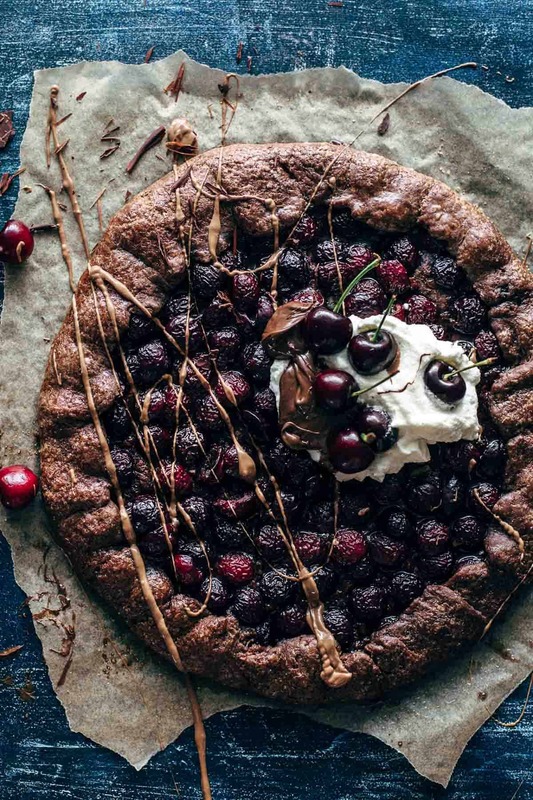 The science of this Chocolate Cherry Galette. 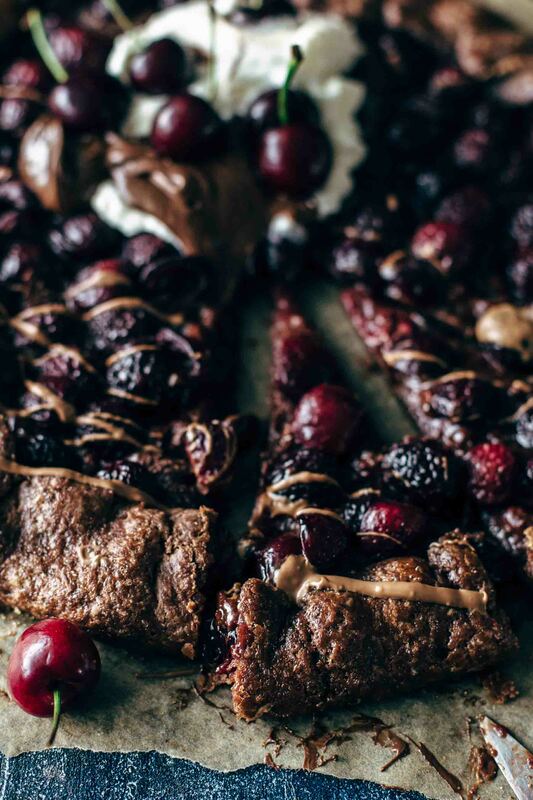 Chocolate and cherries are BFF, so I needed to put them together in this delicious Chocolate Cherry Galette. Galette is like pie but easier to make. You don’t need a pie dish, and all the thinking about the decoration of the pie crust is unnecessary. The look of a galette is very rustic and charming. As you may have noticed, I’m a convinced chocoholic, so it was quite obvious that I even make a Galette with chocolate, wasn’t it? 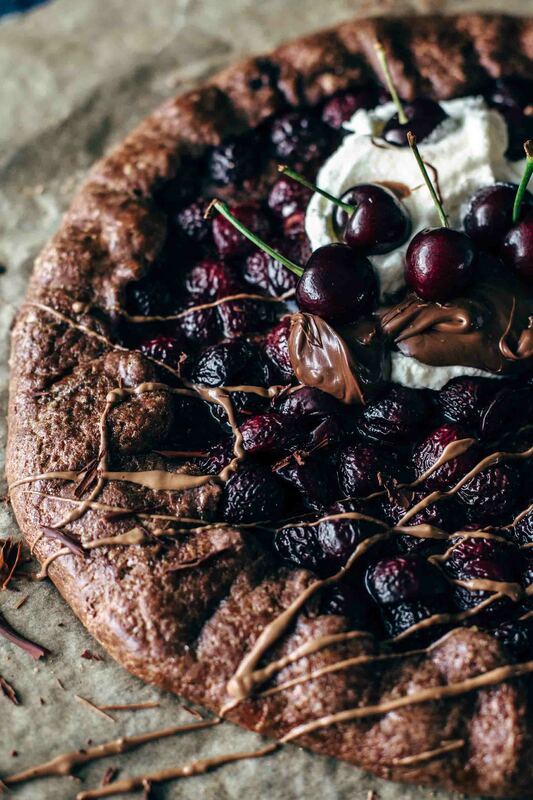 What is so awesome about this Chocolate Cherry Galette? The chocolate pie crust is made of flour, unsweetened cocoa powder, sugar, salt, butter, milk, and water. It doesn’t matter which kind of unsweetened cocoa powder you use. You can go with dutch-processed or natural cocoa powder. 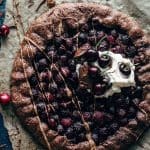 The chocolate pie crust of this Chocolate Cherry Galette recipe is not that much different compared to my other pie recipes which are baked in a pie dish. I added just a bit more flour to make sure the galette holds its shape throughout baking. And cocoa for the taste. The chocolate cherry filling is made of a handful of ingredients. The cherry filling contains fresh cherries, brown sugar, and cornstarch. For this recipe, I used all dark sweet cherries. Because of the sweetness of the cherries, there is just a 1/4 cup of brown sugar in the filling. If you go with other cherry varieties like rainier or sour cherries, you may need to increase the sugar amount to your taste. The cornstarch thickens the filling that it is juicy and tender but not too liquid. As you can see in the photos, you can cut perfect slices without floating your counter. 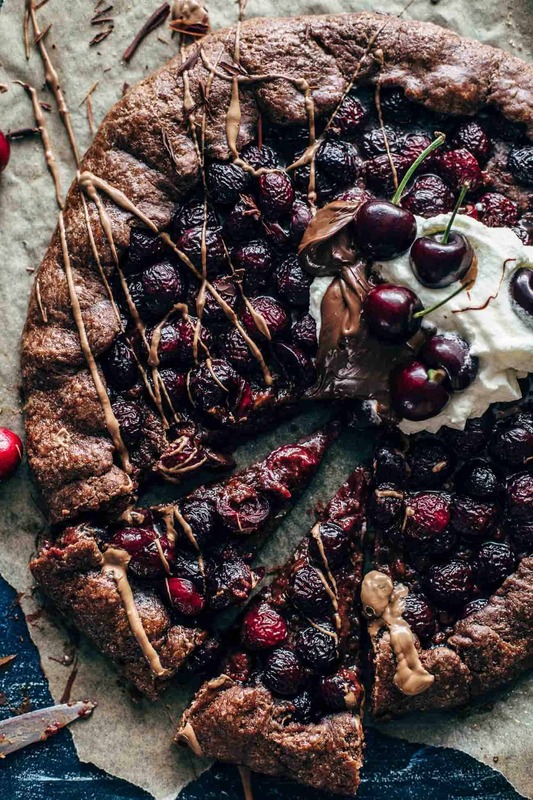 But before you add the filling to the crust, there is something that brings this Chocolate Cherry Galette to the next level: chocolate. After rolling out the dough sprinkle chocolate all over it. Read instructions in the recipe watch the video below. Then place the cherry filling on top of the chocolate. It is like your fresh cherries lay down on a bed of chocolate and buttery pie crust. Sounds like a bed out of my dreams. Chocolate Cherry Galette is best eaten fresh and warm with Nutella, whipped cream, or ice cream on top. I’m still dreaming about this chocolate-pie-crust bed. Seriously. 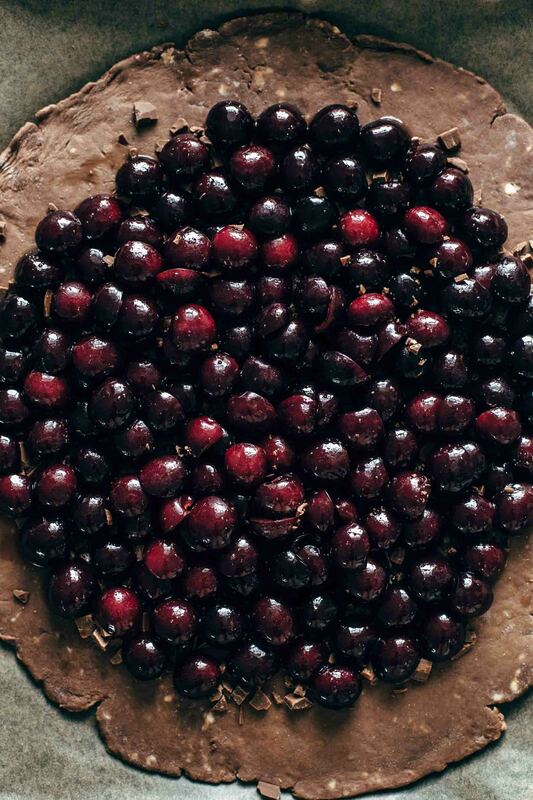 If you make this Chocolate Cherry Galette recipe, rate it and tag a photo #alsothecrumbsplease on Instagram! Would love to see your snap! 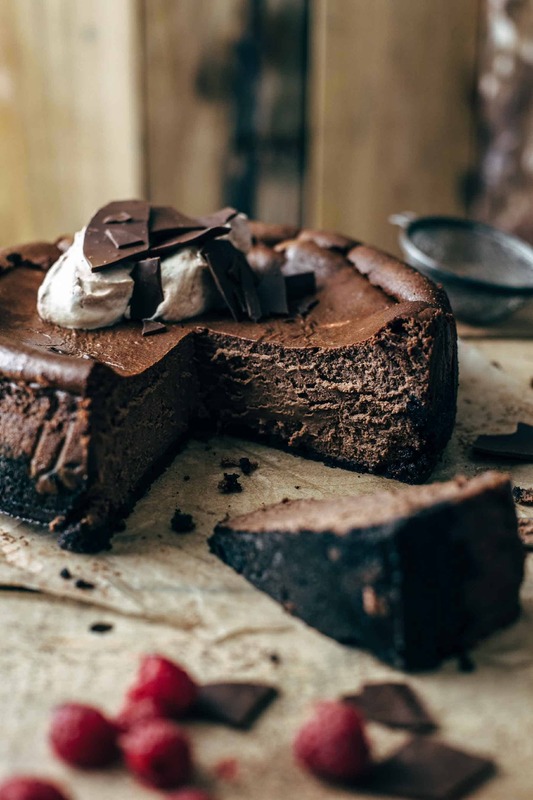 You may also like Authentic Black Forest Cake Recipe, The ultimate Chocolate Pizza Recipe, Chocolate Cheesecake Recipe, Homemade Brownie Recipe From Scratch, or click here to see all chocolate recipes. Put flour, cocoa, sugar, salt, and butter in a food processor and pulse for a few seconds. Pea-sized butter flakes should be still visible. Add one tablespoon milk and water after another and pulse for 1-2 times after every tablespoon. Form pie crust into a disc without kneading. Wrap in plastic foil tightly. Refrigerate for at least 1 hour up to 2 days. In a large mixing bowl, stir cherries, sugar, and cornstarch to combine. Set aside. Roll out dough into a 1/8 inch (0.4cm) thick circle and transfer to the prepared baking sheet. Sprinkle the pie crust with chocolate, leaving 2-3 inch space around the edges. Spoon cherries with very little liquid on top of the chocolate. Fold edges over cherries and press gently to seal the edges. Brush edges with egg white, and sprinkle with brown sugar. Cut butter into small flakes and add on top of the cherries. Bake for about 25-27 minutes. Allow cooling at least 15 minutes before slicing and serving. I am so excited for you and your husband, Sabine. You are so lucky to be moving to San Francisco. That is THE place to be in the U.S. (although it can be hard to find housing and parking and the cost of living is probably among the priciest.) However, it is fantastic that you will be here in America! And this recipe is fabulous. I love anything chocolate + cherry, and even more amazing is how you created your own cherry pie filling (I didn’t even know how to go about doing such a feat). No canned pie filling for you! I would expect no less. Always incredible and can’t wait to have someone as talented as you here in the states. Any employer will be blessed with having you and Mario work for them. Best to you. I know that I’m very blessed with the opportunity to move to San Francisco. Although it is pricier than the life here in Austria, I can’t wait to move. Thank you so much, Amanda! I really appreciate your welcoming mindset. Since the last SF trip, Mario and I only talk in English to each other. We want to be an active part of the community from the very beginning. Amanda, the filling is the easiest. Trust me. I’m sure you would love this recipe! Fantastic recipe, thanks for sharing. I made this the other night and it is absolutely addictive. Adding that layer of chocolate below the cherries is a great idea. Definitely will be making it again. Thank you so much, Brianna! I’m happy that you like this recipe. The chocolate layer is definitely a game changer. This looks delicious and I’m thinking of making this for Thanksgiving! What did you drizzle on the top of the galette? I love the contrast in color, and would like to mimic that. Also, I noticed in the photo that you added a dollop if what I assume is whipped cream. Do you have any particular recommendations for pairings or toppings (e.g,, whipped cream to balance richness, nuts to contrast smooth texture, etc. )?